Let your imagination soar!® With hundreds of combinations, you can create the perfect playset for years of backyard fun. 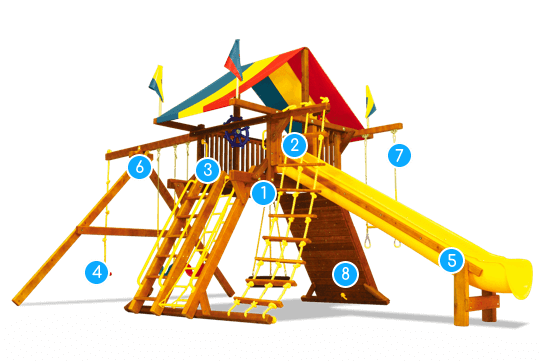 Simply pick your playset style, choose your size, and customize it with extra fun add-ons! The sturdiest free standing playsets in the world are made by Rainbow Play Systems! Find out why our structural integrity is second to none. Where children’s safety is concerned, lightweight, wobbly swing sets simply aren’t going to cut it. Explore our unmatched safety features. Our professional delivery and installation service is available nationwide so you can enjoy your playset without the hassle of setting it up. See how it works. Find out why Rainbow Play Systems has been America’s Most Trusted Brand Name for over 30 years! Recessed hardware ensures clothing doesn't get caught during play. Designed for maximum support by bracing wood against wood. Plastisol is extremely durable, scratch-resistant, and easier for little hands and feet grip. Our 1" thick nylon rope allows for bigger, easy to grab knots and tangle-free fun. Our one-of-a-kind Super Scoop Slide has super high sidewalls and full cedar supports for extra safe (and extra fun) sliding. For 1/2" carriage bolts secure the swing beam to the base structure for an ultra-strong and ultra-stable swing beam connection point. The most durable swing hangers ever created guaranteed to last a lifetime. Decay resistant, 100% sustainably sourced cedar is used for every piece of wood on the playset to create a stunning and durable structure. You truly have to see it to believe it! Bring your family to one of our nationwide showrooms to experience our dedication to quality in person. Climbing, sliding, and swinging is encouraged. Want to see all our products and prices? Request a catalog and page through it with your family to find the perfect playset!